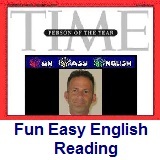 ﻿ Fun Easy English - reading practice and learning about the holiday Spring Equinox. An equinox occurs twice a year (around 20 March and 22 September), when the plane of the Earth's equator passes the center of the Sun. At this time the tilt of the Earth's axis is inclined neither away from nor towards the Sun. The term equinox can also be used in a broader sense, meaning the date when such a passage happens. The name "equinox" is derived from the Latin aequus (equal) and nox (night), because around the equinox, night and day are about equal length. The equinoxes are the only times when the subsolar point (the place on the Earth's surface where the center of the Sun is exactly overhead) is on the Equator. The subsolar point crosses the Equator moving northward at the March equinox and moving southward at the September equinox. On the day of the equinox, the center of the Sun spends a roughly equal amount of time above and below the horizon at every location on the Earth, so night and day are about the same length. Spring is very possibly my favorite season of the year. The temperatures begin warming up, the flowers are blooming, and there is a fresh scent in the air. A nice time to go out and enjoy the natural world. 1. How many times a year does an equinox occur? 2. The equinoxes are the only times when the center of the Sun is exactly overhead in which location? 3. On the day of the equinox, the center of the Sun spends a roughly equal amount of time above and below which of the following? 4. The March equinox (or Northward equinox) is the equinox on the earth when the Sun appears to cross the celestial equator, heading in which direction? 5. The March equinox can be which of the following?